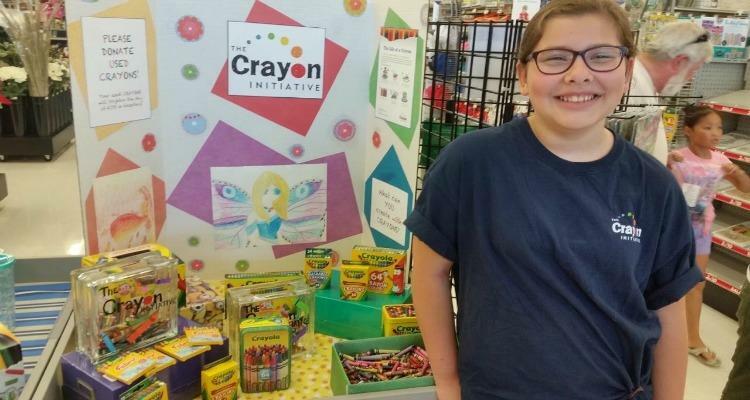 “Avery is standing near the checkout station with her little display and is asking everyone who comes up if they have heard of The Crayon Initiative,” writes Leah Paladino, mother of 11-year-old rising 6th grader Avery, in a recent email to TCI founder Bryan Ware. But Avery is used to standing up for things she believes in and standing alongside those she loves. And she did for her brother Ethan and continues to do it for hundreds of kids in hospitals across America. When Avery was eight years old, Ethan, her big brother and best friend, was diagnosed with an incurable type of brain cancer known as DIPG. Devastated, Avery decided to homeschool so that she could spend as much time as possible loving and supporting her brother. The days that followed were spent in hospitals, watching and waiting for any signs of Ethan’s recovery. It was during those quiet moments that Avery found comfort through art. Coloring not only proved a welcome distraction from the reality of what was going on, but was something that she could share that with her brother, even when he wasn’t feeling well. But after a 15-month battle, Ethan passed away in May of 2016 at the age of 12. His sister, who had become very guarded with her emotions, struggled to express her grief but she continued to create artwork and began to write. That fall, Avery started a new school for 5th grade. After a field trip to an art museum, she wrote a poem about her grief. Avery’s parents rejoiced. Art and writing had become an outlet for the pain she had otherwise been so reluctant to share. Later that fall, Avery learned about The Crayon Initiative at her school. Her principal, Dr. Gaffney, presented the initiative and explained that the crayons they collected would be recycled and donated to help children, especially pediatric patients, receive the gift of art. Avery lit up. She made an instant connection with the project because she’d seen art give her brother back a little bit of what he’d lost – childhood. She and her Covenant School peers collected 100 pounds of used and broken crayons to be recycled and given new life and purpose. Dr. Gaffney, who was and remains one of Avery’s most encouraging supporters, invited Avery to attend The Crayon Initiative presentation ceremony at the University of Virginia Children’s Hospital. It would be the first time for Avery to return to the Battle Building since her brother’s death, but she wanted to be there. During the event, Avery shared the very personal reasons why The Crayon Initiative is so special. But Avery wasn’t done. The Crayon Initiative so inspired Avery that she sought out ways to contribute as an individual the following spring. Thanks to overwhelming support from her community, Avery collected 212 pounds of used crayons through several area schools and the church she attends. Through the generous support of the local A.C. Moore in Charlottesville, VA, Avery is excited to continue her efforts to support the beautiful work of The Crayon Initiative over the summer. She’s set up a display at the store, chock full of her artwork and TCI facts aimed at raising awareness about how much the simple gift of a box of crayons can mean to a child in need. She’s also collecting crayons, enlisting help from four area restaurants as well as from day camp participants of local Cub Scout and Girl Scout programs. Avery has found purpose and healing through continuing Ethan’s profound legacy of caring for others and will continue to think of new ways to get more crayons into the hands of kids like Ethan…like her, who need them.